Deerfield Beach – It may be when you are walking the beach boardwalk that several people burst into song. It may be at the green market when you are approached by a mime. It may be at a local restaurant where a young dance troupe, unannounced, performs a routine. It will be “Anyday, Anytime, Anywhere” that these “Random Acts of Culture” happen. The Ensemble is managed by resident Myrna Meeroff. She, on French horn, and two others, Brian Mirksy, violin, and Marie Schwartz, flute, played the music of Hayden, Beethoven, Hummel and Dauprat. One obvious effect of this brief cultural moment: the mood in the room lightened significantly. “Random Acts” is the idea of TJ Egan who is a volunteer consultant for the Cultural Committee. The plan is to stage at least one Act a month around town, but because the other idea is to keep these events random, there will be no pre-publicity. A sandwich board designed by Parks and Recreation employee Mickey Gomez will be the tipoff. It will identify the performers as being a Random Act. 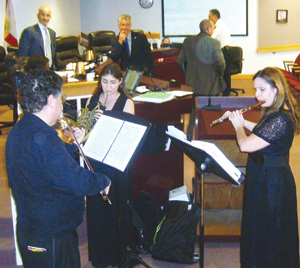 Members of the South Florida Chamber Ensemble perform a Random Act of Culture. The Cultural Committee has long been the sponsor of the annual Festival of the Arts held on the beach in January. The committee also arranges for several concerts a year, the next one on Dec. 7 when the 13th Army Band will play a patriotic concert in observance of Pearl Harbor Day. In the spring, it will sponsor the 2nd annual Storytelling Festival at Constitution Park. The committee operates with funds raised from the art festival and by selling food and drinks at other local events. It receives no tax dollars, but does get advice and some services from the parks and recreation department. Help bring music to the people of South Florida by shopping online using Goodshop.com for all of your needs. Whether you are looking for deals on Levi's jeans, infant bedding at Babies r us, or need a great pattern from Joann Fabrics, Goodshop donates to our Chamber Ensemble upwards of 20% of your shopping dollars. Get great savings at thousands of stores including Macy's and J.Crew while we receive donations towards classical and educational performances for the community!